(Editor's note: some previous photo credits were incorrect due to my editing error, and have been corrected.) 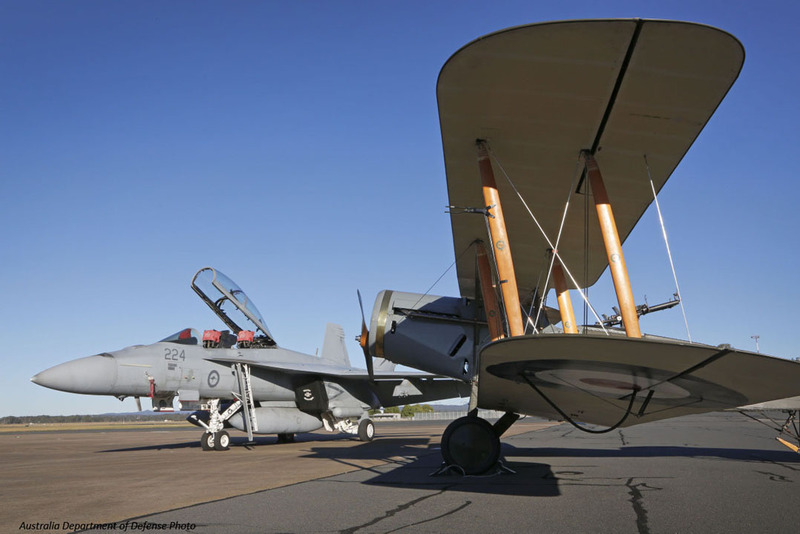 Dies Natalis: 100 Years of Australia's First Flying Squadrons By Dion Makowski A centenary is a significant celebration for any person, let alone an institution in a country as young as Australia. 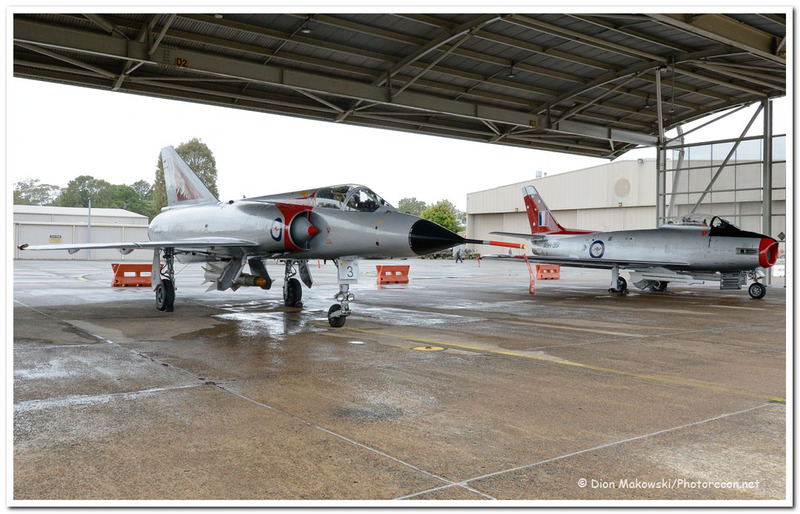 On Friday, 28 October 2016, the Royal Australian Air Force (RAAF) celebrated its' first flying squadrons’ centenaries (of Nos 1, 2, 3 and 4 squadrons), 4 Squadron being the most recent to commemorate its establishment in 28 October 1916. 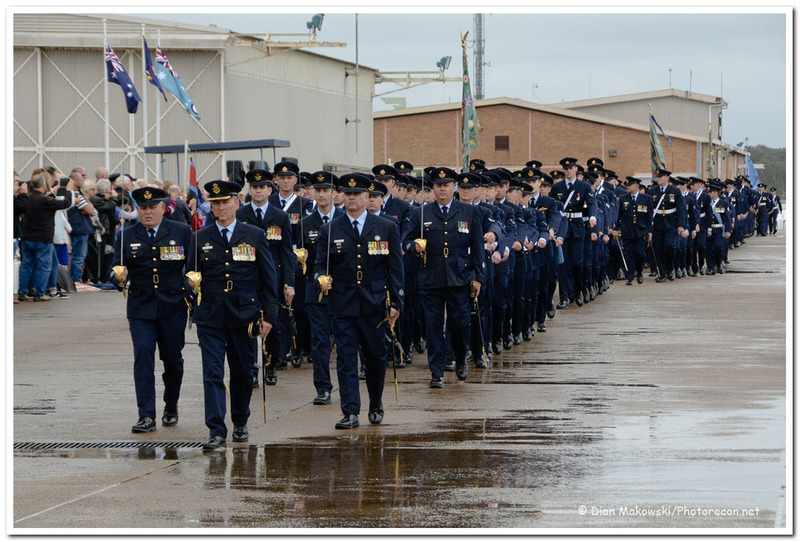 The official program commenced with a colours parade, reviewed by the Governor-General, His Excellency, General the Honourable Sir Peter Cosgrove, AK, MC (Ret'd), as Commander-In-Chief. 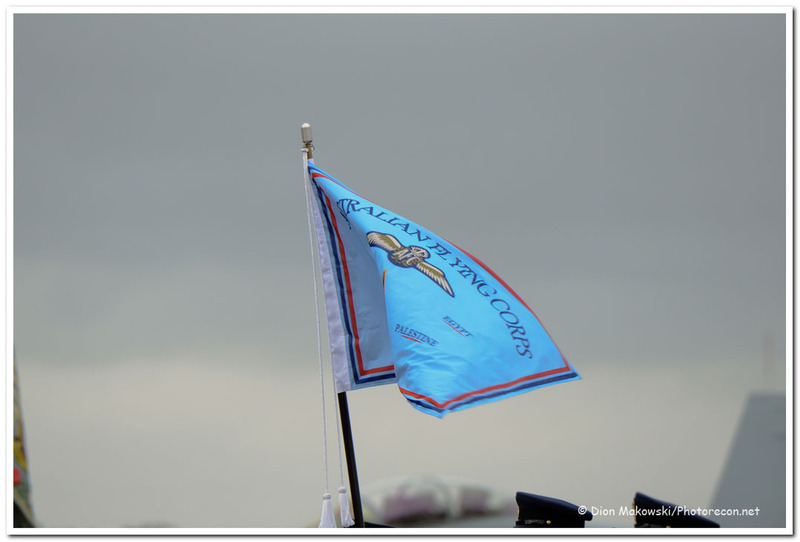 The Squadron colours, for 1, 2 and 3 Squadrons (large, tasselled banners surmounted with gold eagles) as displayed, were replicated from the originals. Officer-In-Charge, Centenary Planning Committee, Group Captain Terry Van Haren, DSM, said: "this event has brought into focus the dedication, sacrifice and exemplary service of Army and Air Force personnel, past and present; highlighting the enduring spirit of mateship with the opportunity to join together in celebration of a proud history that continues with ongoing operations today". 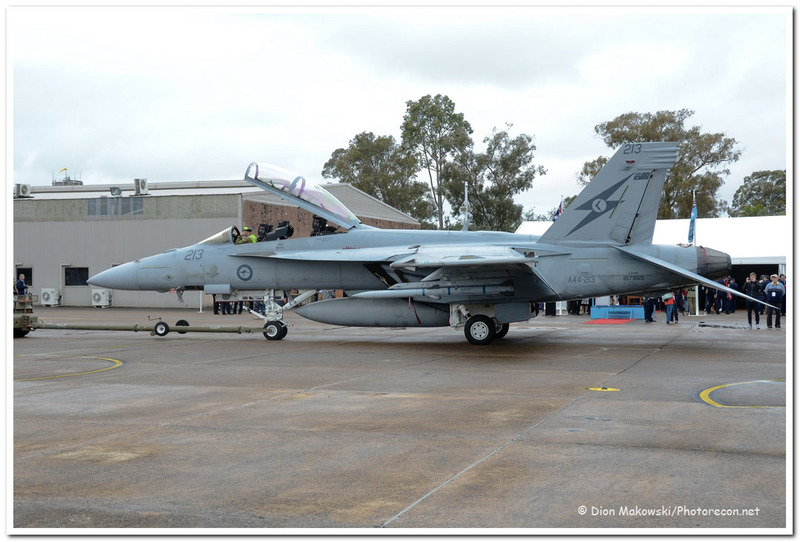 Attending the events were personnel and staff at RAAF Base Williamtown, veterans, their families and a contingent of 1 Squadron personnel visiting from RAAF Base Amberley, Qld. This parade was a rare opportunity to witness over 300 serving personnel in full dress uniform ("LEGO uniforms"), taking the Royal Salute and parading the squadron's colours. 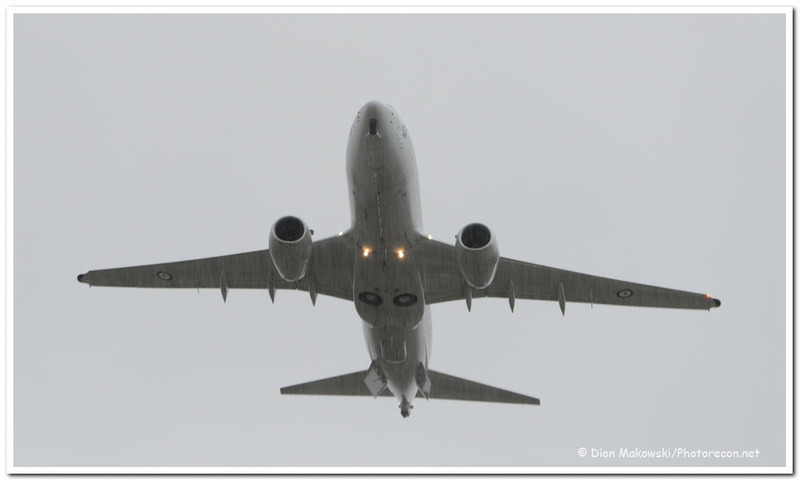 Due to deteriorated weather conditions, the Tiger Moth flyover was replaced with the 2 Squadron E-7A Wedgetail flypast (conducted with A30-005). 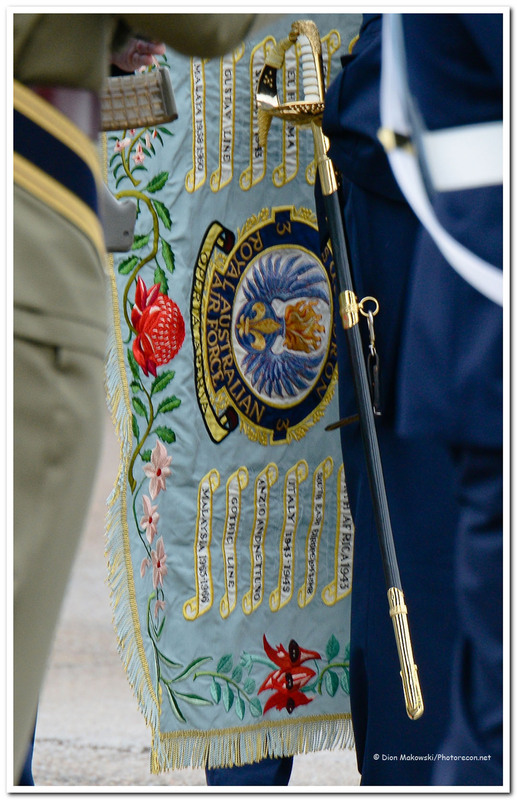 Following the Royal Salute, the Last Post was played, followed by a minute's silence. 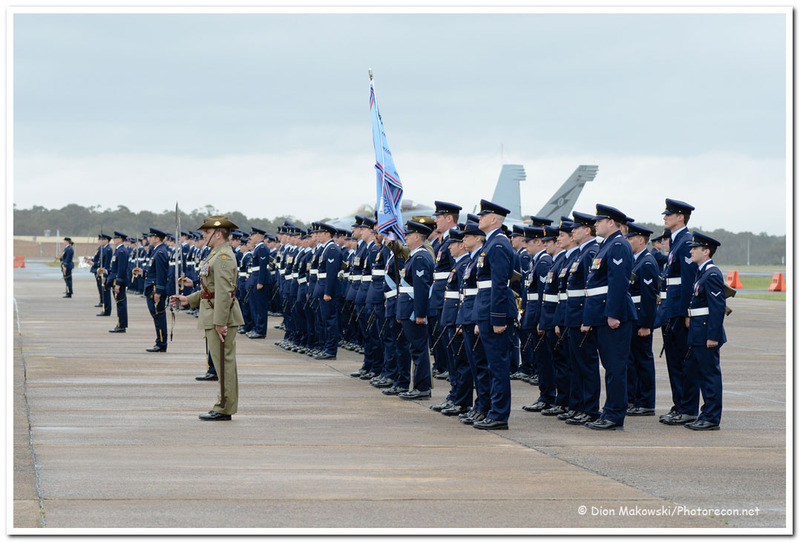 Hearing the playing of the Last Post at an operational RAAF base, attended by many hundreds of serving and veteran RAAF and Army personnel in full dress, could not fail to be moving. 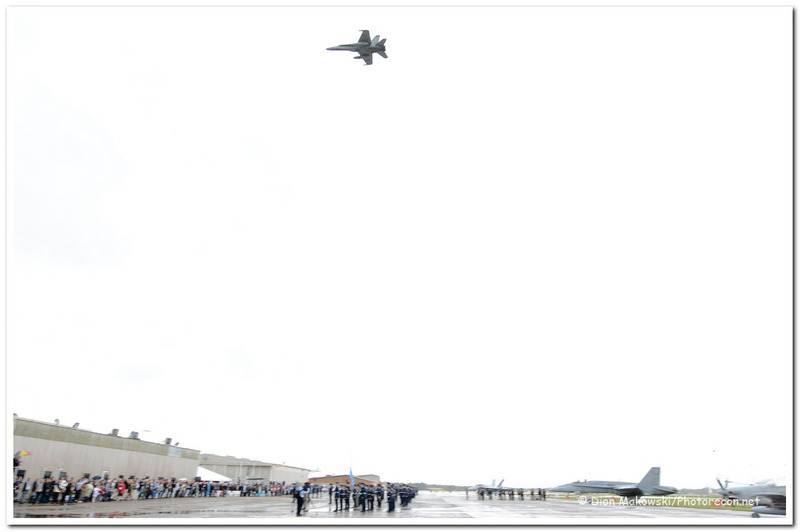 Follow this with a screaming F/A-18A Hornet flypast (with A21-30 doing the honours), breaking hard overhead, is a not-to-be-forgotten experience. This was followed with a combined flypast. For safety reasons, this was conducted with aircraft separated - 1 Squadron F/A-18F; 4 Squadron FAC PC-9/A; 3 Squadron F/A-18A Classic Hornet. 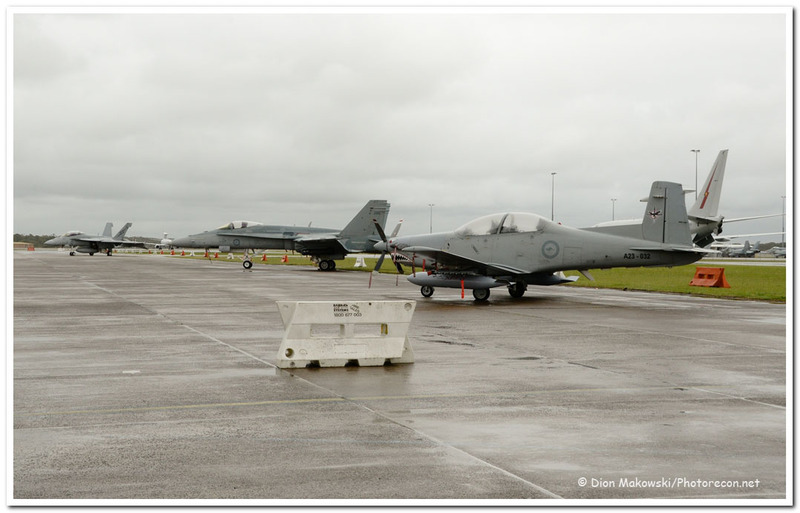 In the afternoon, a flying display was conducted for visitors, featuring Wirraway (VH-WWY), 76 Squadron Hawk Lead-in Fighter solo (A27-13), 3 Squadron "Purple Cobra" 4-ship formation display flight (A21-12, -20, -23, -50) and 1 squadron F/A-18F Super Hornet solo display (A44-201). 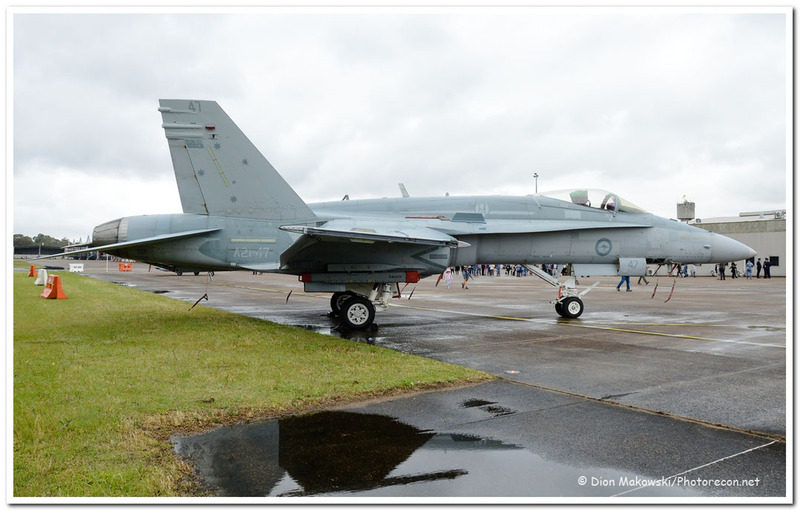 Static displays included: (representing 1 Sqn) Boeing F/A-18F A44-213, (2 Sqn) Boeing E-7A A30-001, (3 Sqn) MDD F/A-18A A21-47 and (4 Sqn) Pilatus PC-9/A A23-032. 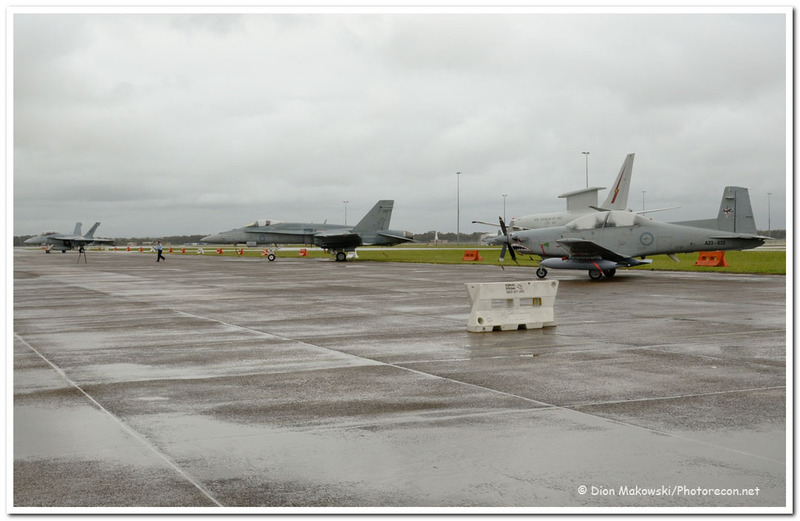 Families mingled with RAAF personnel and during this time we were generously permitted time with squadron senior personnel. 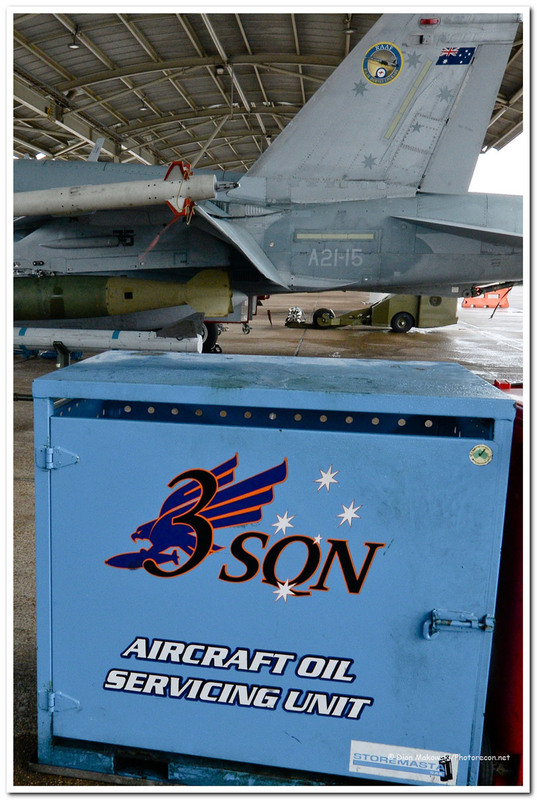 We interviewed some key RAAF personnel for this note - their comments below: Flight Lieutenant Declan Robertshaw, 1 Squadron Weapons Systems Officer (WSO); Boeing Super Hornet: Declan explained that the full suite of tailored solutions is available on Super Hornet - sensors and weapons which give accuracy and ensure a tasking may be successfully completed. When asked the average age of the crews, he responded that your first posting would be on average in your early twenties. He is 24, has been two years at 1 Sqn, flying on average 4 times a week. 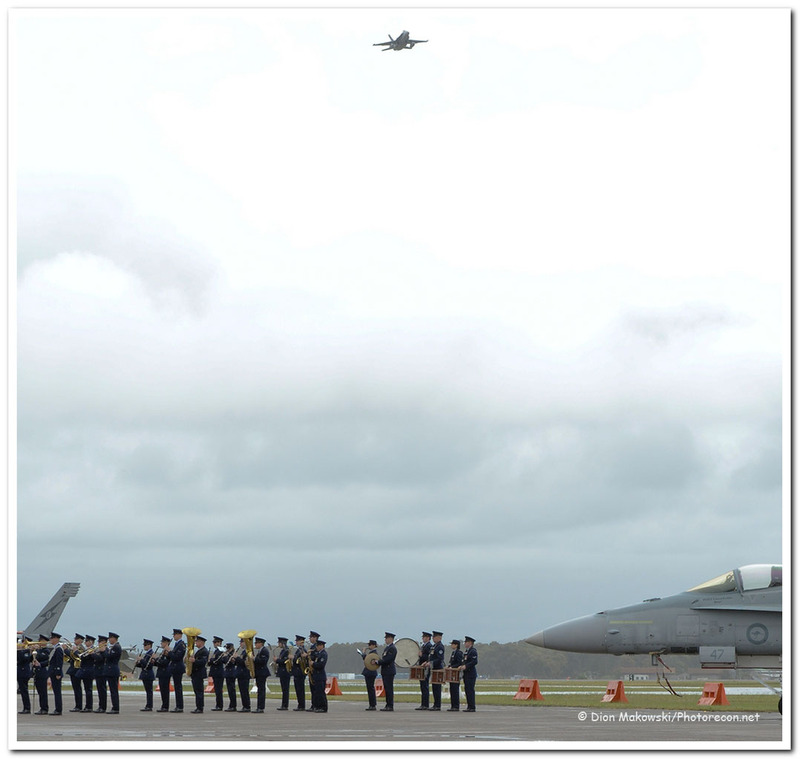 He would anticipate a tour to Middle East Area of Operations (MEAO) when 1 Squadron takes its next rotation. 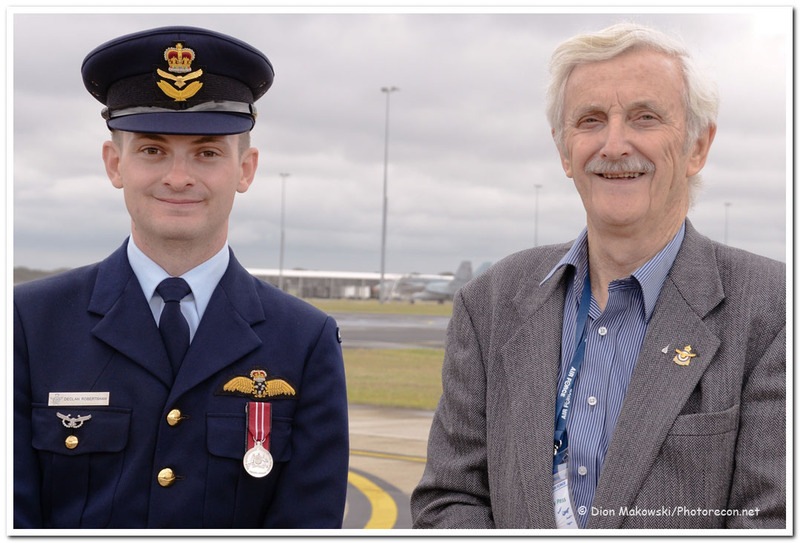 Wing Commander Lance Halvorson 1 Squadron WSO, (Ret'd); Canberra, F-4 Phantom, F-111: When converting onto F-111, due to the well-known delivery delays he was placed back on Canberras, then ferried a Phantom on delivery across the Pacific. 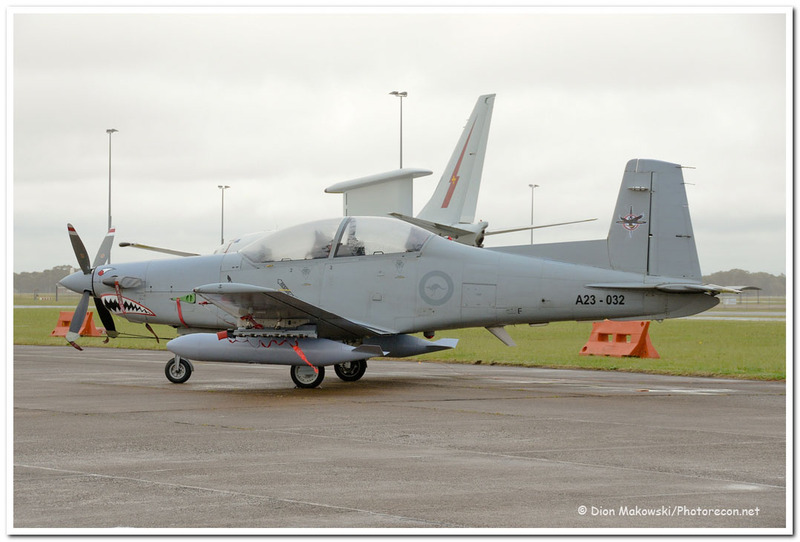 Lance was at 2FTS, Pearce WA as an Instructor on Macchi MB-326H jet trainers, then posted back to Strike. (Lance was 24 years of age on Canberra, 28 on F-111). F-111 was his favourite, the "Cadillac of the sky", it would go anywhere, was air-conditioned and had a minimum 80ft operational height. Normally they would step down to 500ft then 200ft automatically. Flying at night over the Kosciuszkos, talking to the wife on the radio via telephone patch, you get a bit blasé. The Pilot's job was to look after vertical navigation, Navigator's was to look after where you're going and find the target! (24 High grade dumb bombs spread out nicely over about 1.5kms). F-111s were well utilised and used to fly every day - 5 days a week and on weekends too. For example: an around Australia NAVEX for the weekend, routed Townsville-Darwin-Perth... leave Friday back Monday "you've got to overnight when you're out of town"... Wing Commander Chris Martin, 2 Squadron CO: Wing Commander Martin described the E-7A Wedgetail as "THE battlespace management command & control system; determining what comes in or leaves the battlespace and deployment of assets. 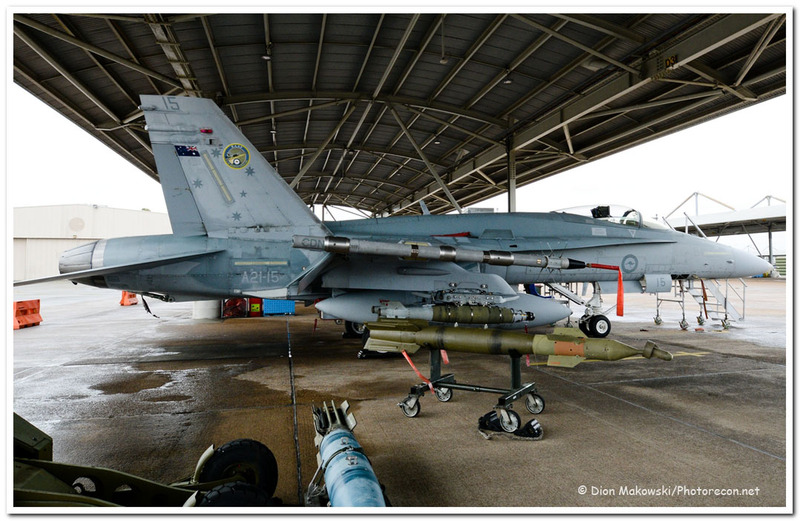 The squadron is currently supporting Operation OKRA - the war on Islamic State, where we have a RAAF Air Task Group comprising 6 "Classic" or Super Hornets on rotation, 1 Wedgetail & 1 KC-30A Tanker. 2 Sqn has for 26 months been conducting daily operations; also training with the United Arab Emirates fighter program (on permanent detachment); Red Flag (Nellis/Alaska training with USAF which has the very best capabilities including Gen.5 assets); Cope North at Guam; Bersama Lima - Butterworth, Malaysia; Pitch Black, Talisman Sabre, almost a dozen exercises while supporting Army and Navy." Flight Lieutenant James Shelton, 2 Squadron ACO; Super Hornet: Regarding the centenary and what it means to him, James described how his Grandfather was an observer (navigator & bomb-aimer) in 3 Squadron in WWI. He also had another relative in the WWII South-West Pacific Area of operations. James certainly feels privileged to be a 2 Sqn back-ender though it is a completely different role. "You'd like to be able to live what they've lived." 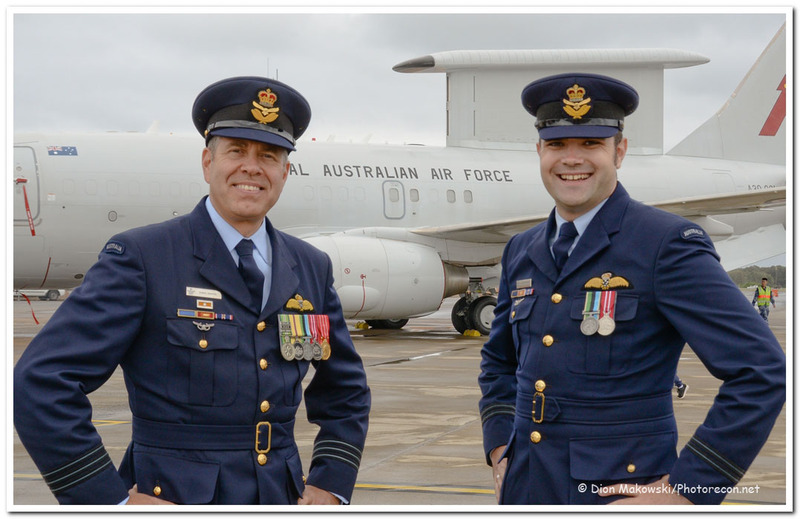 Wing Commander John Haly, 3 Squadron CO: Since April 2016, 3 Squadron has been deployed to the Middle East as part of Air Task Group, on Operation OKRA, the Australian Defence Force contribution to the military intervention against ISIL. I asked Wing Commander Haly his thoughts about the return to the middle east of active Australian Fighting units a full century after WWI. He confirms that while this does play in the background when occasions such as this centenary arise, it is a sobering thought that we are still required to project airpower into the region, "Thankfully, we can understand how we are making a difference to the lives of the peoples of the region." However, his thoughts turn quickly to his personnel, and he states that his ongoing concern is for their wellbeing and safe return from operations - in his words, "The people make the squadron... making 3 Squadron a fine unit indeed". The Histories 2016 has seen worldwide commemoration of the major battles of the Great War, 100 years ago including the crucial and tragic Somme battle and the 1916 Battle of Verdun (between both of which there were more than one-and-a-half-million casualties as both sides attempted to achieve a decision on the continent). Also occurring in 1916, the important naval Battle of Jutland effectively "won" by the British Royal Navy kept the German High Seas Fleet out of the rest of the war as an effective fighting force. At the same time, in Egypt, Great Britain continued her military restructure after the disastrous Gallipoli campaign to take the fight to the Ottoman Turkish and German forces, in what was by some considered the key to winning the stalemate of WWI - entering Europe through Turkey. Into this crucible went the first of the Australian fighting squadrons: 1 Squadron, Australian Flying Corps Formed in January 1916 at Point Cook, Victoria, under the command of Lt. Col. Edgar Hercules Reynolds (credited by some with being the true founder of military aviation in Australia), No.1 Squadron arrived in Egypt on April 14, renumbered as an element of the British Royal Flying Corps as 67th (Australian) Squadron, RFC. Operating obsolete aircraft transferred from 17 Squadron RFC, with detached flights on bombing and reconnaissance duties and up against superior German aircraft, the squadron suffered disproportionately with losses through frequent engine failures in a harsh environment. In 1917, the only Victoria Cross awarded to an Australian airman during WWI, was awarded to Lt. Frank McNamara. McNamara, though wounded by an accidental bomb detonation which also damaged his aircraft, landed the Martinsyde Type 100 biplane to rescue downed pilot Lt. Rutherford, behind enemy lines. Having crashed whilst attempting takeoff in the Martinsyde, pursued by Turkish cavalry and suffering from severe blood loss, McNamara managed to start Rutherford's badly damaged aircraft and flew him back to base. McNamara was not the only noted Australian to serve with this very distinguished AFC unit. Other notable men included Captain Ross Smith - who went on to win the 1919 England to Australia Air Race; Lt. Lawrence Wackett - later a noted aircraft designer and pioneer of the Australian aircraft industry; Lt. Hudson Fysh - co-founder of QANTAS and Capt. Richard Williams (later Air Marshal of the RAAF, Sir Richard Williams - the first RAAF Chief of Air Staff). Future Chief of Air Staff, George Jones, was also serving in 1 Squadron as an air mechanic at Kantara in 1916. Capt. Oswald Watt was the first Australian to qualify for a Royal Aero Club flying certificate, was a pilot with the French Aviation Militaire, B Flight Commander in 1 Squadron and was then promoted to Major and given command of No.2 Squadron. He later became one of only two AFC Officers to command a wing, (as Lt. Col., AFC 1st Training Wing, Gloucestershire) - the other being "Dickie" Williams. In his will, Watt left two bequests to the Australian Aero Club, one of which was used to establish the Oswald Watt Gold Medal for outstanding achievement in Australian aviation. Fittingly, He also bequeathed a sum to the Royal Military College, Duntroon, ACT to award annually a set of binoculars for the best cadet essay on military aviation or aeronautics. The award was founded as the Oswald Watt Prize later in 1921. In January 1918, the unit again became 1 Squadron and contributed greatly to the achievement of air superiority over the German air service in the Sinai and Palestine campaigns. 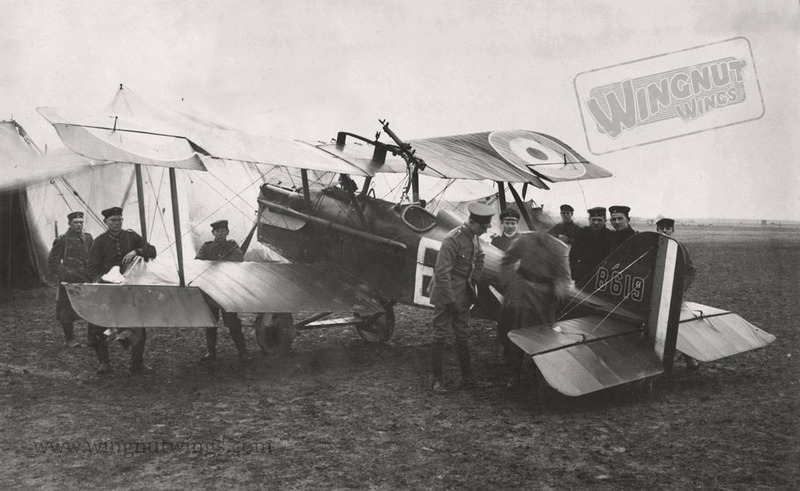 1 Squadron were very successful in long-range photo-reconnaissance and, when finally receiving new, more modern Bristol Fighter two-seater biplanes, they could finally defend themselves in combat. Lt. Austin claimed an Albatross scout on January 3 and 29 more enemy aircraft were to fall to 1 Squadron, AFC. There followed an intense period of engagement supporting the British Army's drive to force Turkish forces out of their Middle East possessions, bombing and strafing the retreating Turkish army in a rout which ultimately led to the fall of Damascus, bringing great credit to a young nation which only three years earlier, had been part of a clear defeat of strategy in the Dardanelles. Supporting an army which included the famed Australian Light Horse, used as "shock troops", 1 Squadron used a Handley Page O/100 Bomber (flown by Capt. Ross Smith) to bomb and destroy an important telephone exchange and railway station which cut communications to Turkish forces and split the enemy army resulting in its destruction. Using the big Handley Page as well as Bristol Fighters, the squadron also supported the Arab revolt against Turkey, led by T E Lawrence and Emir Faisal. Lawrence became immortalised as "Lawrence of Arabia" a British army liaison with the Arab forces aligned against the Turks who sometimes commanded Arab forces against the Ottomans. Lawrence was flown over Turkish positions and to important conferences by Ross Smith. 1 Squadron disbanded on 5 May, 1919. 1 Squadron, Royal Australian Air Force The Royal Australian Air Force was established in 1921. 1 Squadron was reactivated as part of the Citizen Air Force (CAF) in 1925 as a composite (mixed role) squadron, comprising S.E.5As (fighters), DH-9 (army co-operation) and DH-9A (bombing). Westland Wapiti biplanes replaced the WWI bombers while the S.E.s were retired in 1928. In the 1930's as a specialised bomber unit, 1 Squadron retained some Wapitis and newer Hawker Demons and Bristol Bulldogs were added as fighter-bombers from 1 Flying Training School, Point Cook. They also operated DH-60 Moth aircraft. In 1939, the RAAF's first Commonwealth Wirraways were received, followed by Avro Ansons. As a bomber-reconnaissance unit, 1 Squadron sent Hudsons to Malaya in 1941 (the first RAAF unit to operate this important type). Shortly after midnight, local time, during the night of 7/8 December, the Japanese Malaya invasion force started landing on the beaches at Kota Bharu, close to the airfield, and from about 02:00, No. 1 Squadron launched a series of assaults on the Japanese forces, becoming the first aircraft to make an attack in the Pacific War. The Hudsons sank a Japanese transport ship, the IJN Awazisan Maru, and damaged two more transports, the Ayatosan Maru and Sakura Maru, for the loss of two Hudsons, an hour before the attack on Pearl Harbor. Suffering heavily in the Japanese invasion, the remnants evacuated to Australia and disbanded. In 1943 1 Squadron reformed as a Beaufort Bomber unit, Northern Territory based, attacking the Japanese-held Dutch East Indies, later re-equipping with DH-98 Mosquitos and disbanding in 1946. Reformed as an Avro Lincoln heavy bomber squadron during 1948 at RAAF Base Amberley, near Ipswich, Queensland, 1 squadron deployed against communist guerrillas in Malaya, including night missions. Re-equipped with GAF Canberra MK.20 jet bombers, later with leased F-4E Phantoms and finally in 1973, as the RAAF's Strike squadron, the long-awaited and awesome F-111C strike aircraft. The RF-111C reconnaissance airframes were transferred over in 1997. After 37 years of "dedicated deterrence", the 1 Squadron F-111 capability was retired in 2008 and replaced with Boeing F/A-18F Super Hornets, allowing 1 Squadron to resume strike capability with an augmented air combat capability by December 2010. 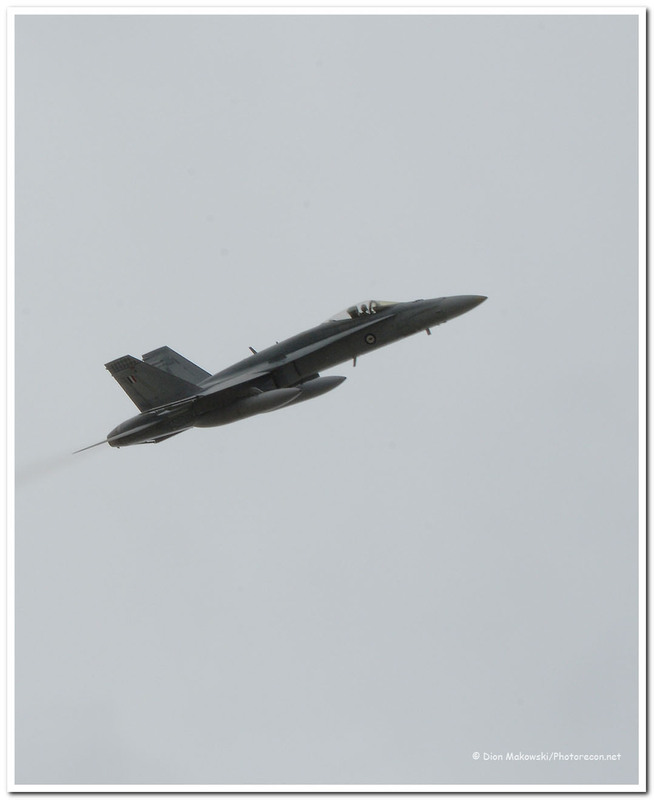 1 Squadron F/A-18Fs have since deployed to the Middle East Area of Operations (MEAO) in the coalition campaign Operation Okra against Islamic State/Daesh. 2 Squadron, Australian Flying Corps Formed at Kantara, Egypt on September 20, 1916, the 68th (Australian) Squadron, RFC was commanded by Major Oswald Watt and transferred to Harlaxton, UK in January 1917 to train under Watt's supervision for Western Front operations. 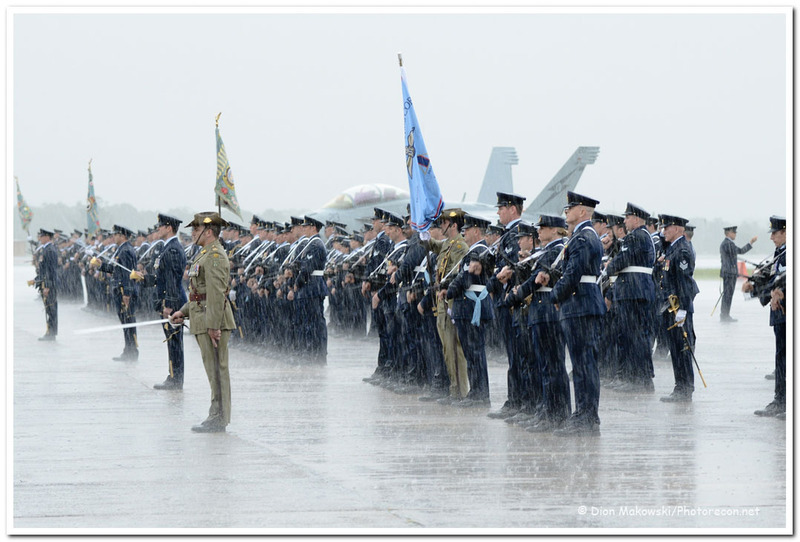 It is assumed the cadre of personnel included some from Australia, who were possibly allocated initially to No.2 squadron AFC. It has been said that 2 Squadron's personnel were composed largely of former Lighthorsemen. In September the 68th Squadron flew to France, operating DH-5 biplanes mainly in the ground attack role. In the vicinity of Saint-Quentin on 2 October, the 68th Squadron became the first AFC unit in Europe to see aerial combat when one of its patrols engaged some German two-seaters, which managed to escape. During late November, Lt. F Huxley claimed the AFC's first aerial victory - an Albatros scout, during a strafing attack. Ground attack was dangerous work, resulting in many losses of men and machines. In December, the Squadron withdrew from operations to re-equip with S.E.5As. In January 1918, the squadron became 2 Squadron, AFC. It was now a true scout (fighter) squadron, again operating over French lines with great success in what is now termed the air superiority role. Fighting was intense, with S.E.5A aircraft operated (like RAAF aircraft today), as multi-role aircraft, scouting, strafing and bombing the German lines during the period of Operation Michael: the 1918 German Spring Offensive (March 21 - April 5, 1918). 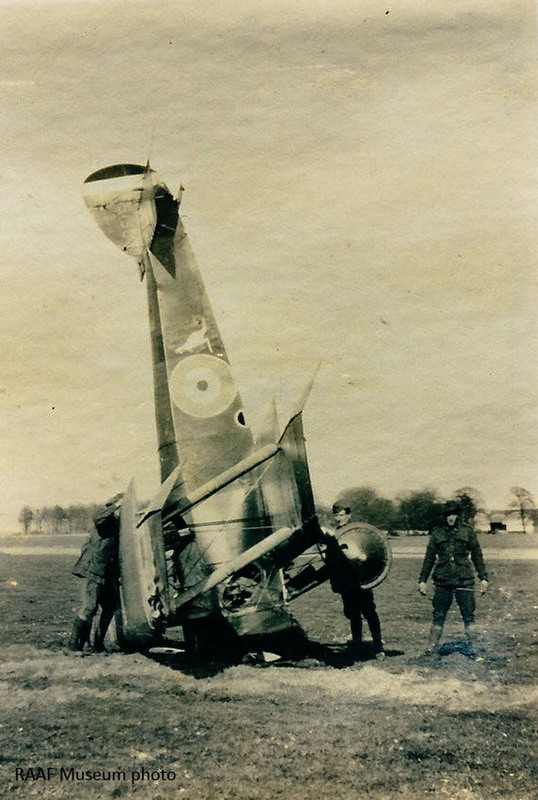 This period saw perhaps the most intense fighting in the air, victories and losses were of historic proportions (some sources claim during one two-day period in May, for the loss of one S.E.5A, 2 Squadron shot down almost the numerical equivalent of a squadron of German aircraft). One pilot - Capt. Les Holden, later to make a name as a pioneer in New Guinea aviation and considered a daring pilot, was reputed to have used an average of one aircraft per day during this period. Another noted pilot was Roby Lewis Manuel, DFC, who joined the unit in February 1918. Between April and September, 1918, Manuel was in the thick of the fighting, finishing the war with 12 victories (three were shared). He was a legend in the Mallee district of Victoria, flying up until his passing in 1973, the last Great War pilot still flying. Moving base repeatedly as the ground situation changed, until the end of the war, 2 Squadron worked with 4 Squadron on massed ground attacks and fighter sweeps, supporting the allies to field and support overwhelming forces against an exhausted and retreating enemy. Disbanded May 6 1919, 2 Squadron had a distinguished war destroying 94 enemy aircraft and incalculable damage to ground targets including troops, airfields and war materiel, finishing with a total of 18 "aces". 2 Squadron, Royal Australian Air Force The squadron was briefly re-raised in 1922 as part of the newly independent RAAF, but was disbanded after only a couple of months and not reformed until 1937 with Ansons, then Hudsons in 1940. Of interest, the oldest known surviving 2 Squadron airframe is an Anson which is currently under restoration in South Australia. Facing similar heavy attacks and taking heavy losses (as did 1 Squadron) against the Japanese invasion of the Dutch East Indies, it operated offensively for the duration as a bomber unit in the South West Pacific Area in World War II with Hudsons, then Beauforts and later with Douglas A-20 Bostons. It operated with distinction post-war. 2 Squadron flew Canberra bombers from Butterworth, Malaya, during "Confrontation" with Indonesia and operated very effectively in the Vietnam War. The squadron was again disbanded in 1982, following the retirement of the Canberra, the most highly decorated unit in the RAAF. 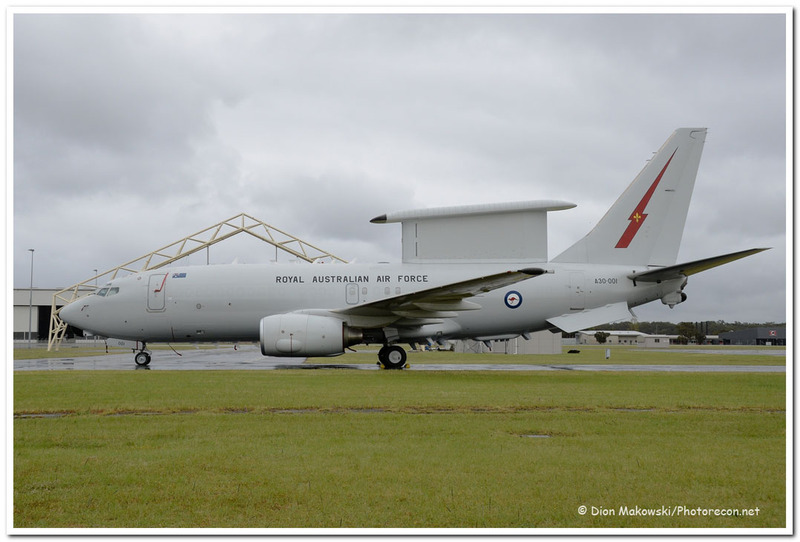 It was re-formed in 2000 to operate the Boeing E-7A "Wedgetail" Airborne Early Warning & Control (AEW&C) platform from RAAF Base Williamtown, near Newcastle, New South Wales. 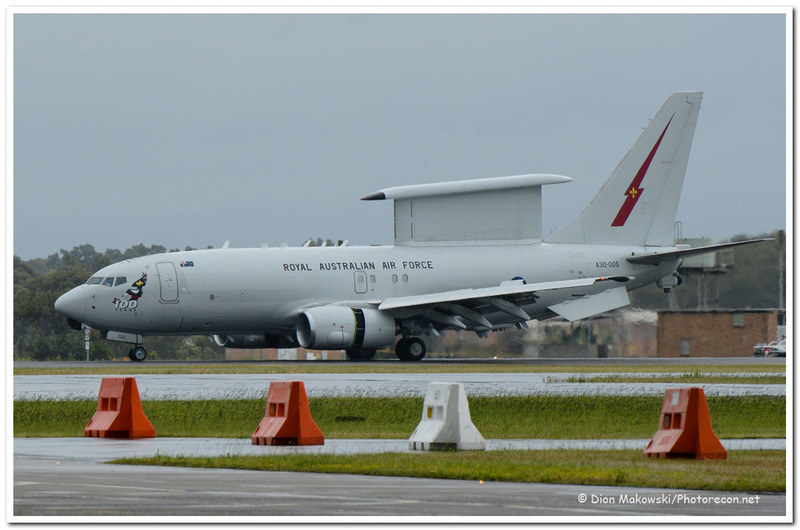 One of the six Boeing E-7As was deployed to the Middle East in September 2014, as part of Operation Okra, Australia's contribution to the military coalition against Islamic State. 3 Squadron, Australian Flying Corps September 19, 1916 saw 3 Squadron established at Point Cook (originally established as No.2 Squadron but renumbered as 3 Squadron on its arrival in England). The squadron commenced operational training, being the first AFC unit to arrive in Europe, principally as a ground-support unit. 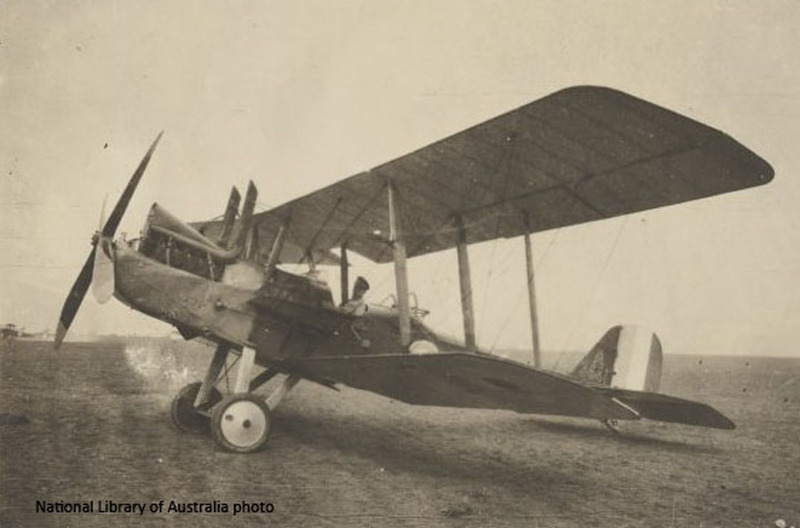 Again equipped with largely obsolete two-seater types, and designated 69th (Australian) Squadron RFC, it reverted to 3 Squadron AFC on January 19, 1918. The squadron supported allied operations with artillery observation "arts obs", bombing, strafing, tactical reconnaissance and photographic reconnaissance missions in the British and Canadian areas. Flying the R.E.8 or "Harry Tate", possibly the best reconnaissance aircraft available to the corps in numbers, the 69th Squadron deployed to France on 10 September 1917 which meant they were the first Australian Flying Corps squadron to deploy to France. During November 1917 the squadron became the corps reconnaissance squadron attached to the 1st ANZAC Corps at Messines, ready for the crucial battles of 1918. Eventually, 15 enemy aircraft were claimed by its pilots. The R.E.8 proved to be a tough aircraft in combat and crews seem to have had enough confidence to directly engage the Germans. A very unusual incident became iconic, which involved a 3 Squadron R.E.8 crewed by Lt. Sandy and Sgt. Hughes. The Australians were attacked by six Albatros scouts on December 17. One enemy was forced down, wounded by the Australian observer. This aircraft was later presented to the Australian Government as a war trophy, where it is now displayed at the Australian War Memorial. However, during the engagement Sgt. Hughes was hit in the chest and mortally wounded, while the same bullet struck Sandy in the head, killing him instantly. The R.E.8 was only slightly damaged and continued flying, in wide circles until it landed, out of fuel, relatively intact in a snow drift 80km from the scene of the combat. The squadron remained active throughout the German Spring Offensive, continuing to make a good account of themselves including instances of holding their own against formations of German fighters. They were in action on April 21, 1918 when the Red Baron - Manfred Von Richthofen - was shot down over ANZAC Corps trenches. 3 Squadron took custody of the remains as well as the aircraft (which was subsequently stripped for souvenirs) Famous footage exists of the burial with full military honours at Bertangles, attended by officers and ranks of the squadron. Disbanded February 28, 1919, their legacy was to receive high praise from Major-General Sir John Salmond, General Officer Commanding, Royal Air Force, France, who said: "A great squadron....the best corps squadron in France". 3 Squadron, Royal Australian Air Force Was re-raised as a permanent squadron of the RAAF in 1925, equipped - as many RAAF squadrons were - with S.E.5As, DH-9s, Wapitis and Demons. During World War II it operated in Egypt against Rommel's German Africa Korps in the army co-operation role. As part of the Desert Air Force, 3 Squadron flew Gloster Gladiator and Gauntlet biplanes, Westland Lysanders, Hurricanes and Curtiss P-40 Tomahawks and Warhawks. Participating in the invasion of Italy and the liberation of Yugoslavia, it re-equipped with P-51 mustangs in 1944. During WWII, it had become the highest-scoring RAAF fighter squadron. The Cold War years saw the squadron disbanded and re-raised twice. 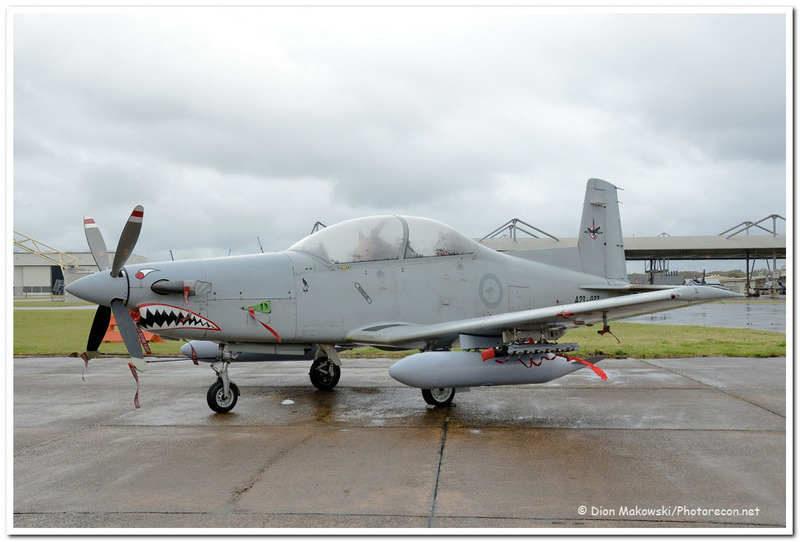 Once, briefly as a tactical reconnaissance and army support unit in 1948-53 and later, 3 Squadron reformed at RAAF Base Williamtown NSW, near Newcastle with North American (Commonwealth CA-27) Sabre jet fighters. It was based at RAAF Butterworth during the Malayan Emergency and the Indonesia–Malaysia Konfrontasi. Dassault (GAF) Mirage IIIs replaced the Sabres from 1967 and the unit deployed to Malaysia for the next decade and a half. 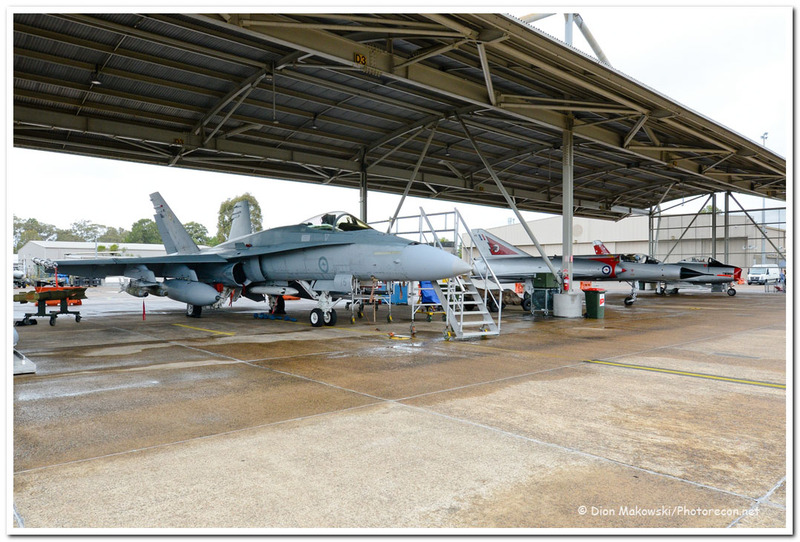 Becoming the first operational RAAF squadron equipped with McDonnell Douglas F/A-18A Hornet multi-role fighters from 1986, 3 Squadron continues to be based at RAAF Williamtown. The squadron deployed to Diego Garcia in 2002 to provide local air defence, and the following year contributed aircraft and crews to the invasion of Iraq as part of Operation Falconer. In April 2016, it deployed to the Middle East as part of Operation Okra, the military intervention against Islamic State. 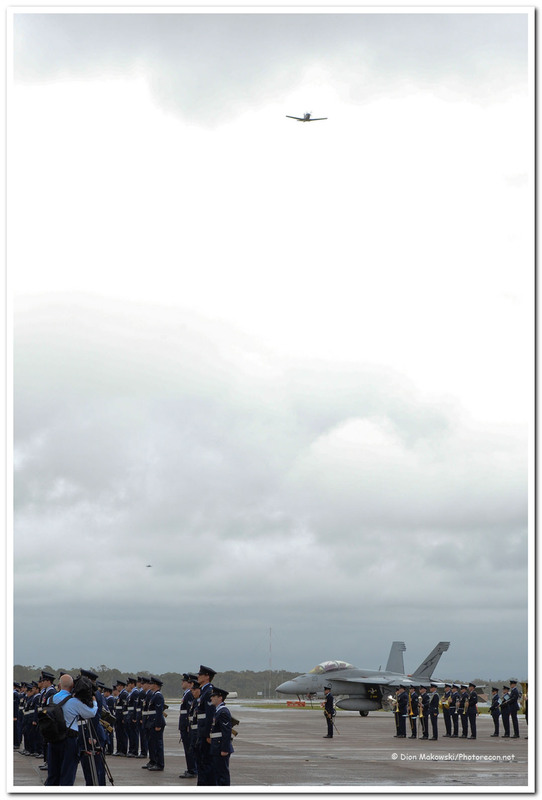 3 Squadron has been named as the first operational RAAF squadron to receive the F-35A Lightning II, with the unit expected to reach operational capability by 2021. 4 Squadron, Australian Flying Corps Formed October 26, 1916 at Point Cook, the squadron was sent to England as the 71st (Australian) Squadron, RFC. Flying the immortalised Sopwith Camel scout, the squadron became operational mid-December 1917, commencing combat operations a month later. Success came quickly to the unit, and on January 19, reverted to the numbering of 4 Squadron. Regularly engaging the famous "Richthofen's Flying Circus", they acquitted themselves well, causing severe losses to the Germans in their operational sector. 4 Squadron finished the war with 128 aircraft officially destroyed and 11 aces. Australia's highest-scoring air ace, Capt. Harry Cobby, alone destroyed up to 29 aircraft and 13 observation balloons. Like 3 Squadron, 4 Squadron were caught up in the 1918 "Spring Offensive". With ground attacks and anti-personnel missions to assist the allied armies, the result was many damaged Camels and losses to ground fire. Thereafter, air combat continued against arguably the best scout aircraft the Germans produced in WWI - the Fokker D.VII. While not all combats were favourable, 4 Squadron continued to have success with aggressive techniques and perhaps, a little inkling that the war was finally going the allies' way. Sometimes, flying operationally with formations including 2 Squadron's S.E.5As, produced a competitive spirit among the Australian scouting squadrons. Re-equipped with Snipe scouts, possessing better performance than the now-rapidly obsolescing Camels, the squadron continued having great success in some of the large-scale air battles made famous in film and novel. 4 Squadron became part of the post-armistice Allied Army of Occupation in Germany (the only Australian squadron so chosen), based at Bickendorf Aerodrome, Cologne. On February 28, 1919, the squadron disbanded and along with the other Europe-based Australian units, returned to Australia.